Estonian History. A Nation Born of Shock. Photo: Rahvusooper Estonia. For states across Central and Eastern Europe, 2018 marks the centenary of their national independence, gained in the aftermath of WWI. In the case of the Baltic States, this independence was, of course, lost in the aftermath of WWII, when they became not simply a part of Comecon and the Warsaw Pact, but were directly incorporated into the Union of Soviet Socialist Republics. Following the collapse of the Soviet Union, the Baltic countries initially reverted to their pre-war constitutions, seeking to affirm political legitimacy in terms of a restoration of sovereignty, rather than simply an assertion of “post-Soviet” independence. If the principle of “small nations” foreign policy is the forging of alliances, then the accession to the EU and NATO during the 1990s was another momentous historical change, even as these alliances are now beset by new challenges. (Paradoxically, Brexit may even have a unifying effect for the EU 27, faced with the rise of European nationalist parties.) Other de-stabilizing effects come not only from Russian interference in European political processes, but from the seeming disregard for historical understanding within the Trump administration, whether regarding Europe, the Korean peninsula, or climate change. By contrast, learning not only about, but also from, history has always been a touchstone of liberal education, one medium for which is, of course, theatre – a practice that remains state-supported throughout Europe. 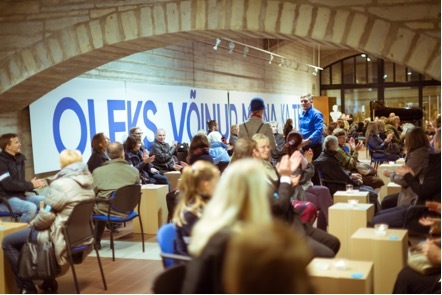 In Estonia, the 1918-2018 centenary has been commemorated by a unique, year-long theatrical project – Tale of the Century – consisting of collaborations between big repertory theatres and small independent companies from all over the country (creating 13 productions, each focusing on a particular decade, with one also addressing the next 100 years). 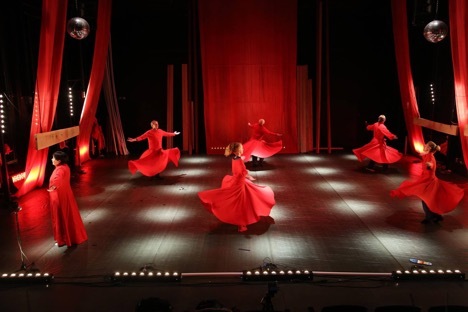 The Estonian government made specific funds available to the country’s union of theatres, which organized the collaborations and the decade-assignments by lottery. How the companies – ranging from the national opera to a small touring group specializing in comedies – then used the funds was left entirely up to them. For the independent groups, this often meant a significant budget to realize a project that would not otherwise have been possible; while for major institutions, these specific funds for a new commission could be supplemented, if necessary, by their existing budgets. Not all of the collaborations worked out, and some of the productions referenced their allotted decade rather tangentially (although whether the final piece was what would have been made with the themes anyway was not necessarily obvious). As part of this year’s Estonian theatre festival, held annually in Tartu, all the Tale of the Century productions were brought together in one week. Performed with translations (thanks to the Estonian Theatre Agency), the festival invited an international audience, mostly from the Baltic region. This was a privileged opportunity to learn about how the idea of a national story (in the tensions between myth and history, “archive and repertoire”) might itself refract the range of Estonian theatre (or theatres) today. Despite the device of the lottery, which forestalled any singular direction to the whole project, there still seemed to be some latent expectation that the productions might provide evidence for some identifiable Estonian “national character.” After all, theatre is itself one of the inherited national forms of cultural representation, and audiences – despite the diversity of theatrical languages – still look to the centennial project for an understanding of what it might mean “to be Estonian” today. The appeal of and to such a phantom of “national identity” remains emblematic of populist politics. It is also typical of the era of authoritarian governments during the inter-war period across the region – still mostly conceived of as the founding era of (pre-Soviet) national sovereignty. This phantom is also a cause of ambivalence for those of other political persuasions, addressed, for instance, by Chantal Mouffe in her advocacy of a left-wing, “alternative” populism. As taken here (from a 1935 Estonian government publication for Anglophone visitors, which I found in a second-hand bookshop while in Tartu) the following suggestion is still resonant: “Estonian cultural life reflects the national aims and peculiarities of the people. If character is moulded by difficulties, the Estonian national character developed in the hardest of schools…” Although eliding “cultural life” with “national character” – in a claim to speak for “the people” – remains an ambition of many politicians today, this was happily contradicted in certain respects by the centenary commissions. Nonetheless, there were many ways in which the productions, despite their differences, still conformed to such expectation (which is, perhaps, the more interesting aspect to review, as it suggests that an “internationalist” perspective may also prove anachronistic in its own way). At one level, what the festival demonstrated was that there is not (and indeed, could not be) one Estonian story or theatre in the sense of the “small nation” myths that are so beloved of right-wing populism in Estonia as elsewhere. The Estonian equivalent of Poland’s PiS and Hungary’s Fidesz parties is called EKRE, whose leaders have made similar attacks on the principle of an independent judiciary. What the festival celebrated was the diversity of both stories and theatrical idioms, including in the examples of the failed collaborations, where different artistic practices were not reconcilable in commitment to any “national” story. This was strikingly manifested on opening night, where neither of the two performances shown were joint productions. Both Revolution, by the renowned Tallinn-based company NO99, and Journeys. Promised Land, by the distinctive performance artist, kadrinoormets, had clearly declined their invitations to the “national story” ball. But while the former offered a cosmic vision (drawing upon an epic poem, Meter and Demeter, by Hasso Krull, which gathers together myths of creation and destruction from across the world), the latter was exemplary in simply invoking a particular detail of Estonian history, one that is generally ignored: the emigration during the 1920s of nearly three and half thousand Estonians to Brazil who took up the offer of “a free one-way ticket – going to the promised land where they hoped to find rivers of milk and flowing honey” (kadrinoormets). During the festival, I took up reading the Estonian writer Kai Aareleid’s 2016 novel, Burning Cities, with its comparative example for exploring historical narrative. Giving voice to the handing on of individual objects between generations, from before the war up unto 2013, her novel offers many occasions for thinking again about details in the work of the stage. At the heart of Aareleid’s story, a woman, Tiina, reflects on growing up in Tartu during the 1950s, constructing the memories in which the reader becomes immersed, woven around the few items which have survived the passing of lives and which, ultimately, fit into a shoebox. In almost the last line of the book, the reader shares the thoughts of the now aged Tiina, looking at “[a] beaker bearing Dad’s monogram – strange how it’s still here when so many other things have vanished, one by one. Like a bridge to a bygone time when everything still held together intact.” It is curious that the past is so often evoked in offering such a vision of unity in place of fragments – a vision, perhaps, of retrospective hope (despite the historical facts of war, for example). In such hope, it is the detail – bearing the sense that at some point things could always have been better than they turned out to be – that both stands for, and yet refutes, an unrealizable whole. In the twentieth century, the question of hope was not confined to such a retrospective poetics of the private, but publicly mobilized in a politics of the future. Here the same metaphor of building bridges (this time as a collective endeavor) provided a significant shift away from the ostensibly utopian beginning of the NO99 performance. 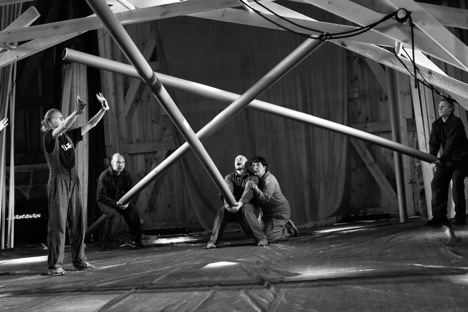 As a group accomplishment, an arch was constructed by the performers on stage, both materially and symbolically transcending individuals through the shared trial and error of balancing multiple pieces of wood. “Revolution” was no longer understood in terms of the spiritual whirling of the Dervish that began the performance, but as practical work. To start this section of the show, the cast had stripped themselves of the red vestments of their initial ritualized appearance to reveal blue overalls beneath: their bodies became transformed from the meditative devotion to a spiraling energy connecting earth and sky, inside and outside, into spasmodic bodies crippled by the modern separation of inner and outer. In the dystopian aftermath, the “revolutionary” cycles of renewed life (the figure of Demeter) gradually turned the human destruction of life into the very self-destruction of humanity, with strange underwater organisms the only heirs to a second deluge covering the face of the earth. Here the “national” was subsumed in the global (in terms that one might associate with Donna Haraway’s invocation of the Chthulucene), which relativized the idea of “independence” far beyond the appeal of 100 years, in what could also be taken as a reflection on the ambition of the centennial commission itself. I must confess, however, that there were moments when I wondered how seriously I was supposed to take the performance, where it seemed contrived rather than developed, stuck in a dynamic of repetition rather than exploring the varied senses of “revolution” that were proposed. But then again, perhaps this very dynamic was the “lesson” being offered as an experience of theatre. A cosmic perspective on the “Tale of the Century” was also offered by the one opera project, Estonian History. A Nation Born of Shock, performed in the middle of the festival, which was for me a high point. Estonian History offered a collaboration between the Estonian National Opera company and an independent arts collective, Kanuti Gildi Saal. The collective was represented by a fictional composer, Manfred Mim, who was also one of the principal figures on stage, together with the historical polymath, Lennart Meri, and another fictional character, an ancient Greek explorer and poet. The familiar opening speech about switching off mobile phones was made part of the show, as we were invited to believe that certain sonic frequencies used in the opera would wipe data from electronic devices if they were not completely switched off. While this idea turned out to be consonant with the themes of the work, it was interesting how the suggested assault on the device felt like a threat to the person (such is the dependence, imagined or otherwise, on digital technologies). Then the houselights went down and the opera started, accompanied first by a film in which space dust coalesced into fragments of a cup and saucer, which, in a demonstration of time running backwards, rearranged themselves as resting on the desk of Lennart Meri, a writer bashing out thoughts on a typewriter. Meri was the author of the novel (Silverwhite ) on which the opera draws (and, amongst other things, the first president of post-Soviet Estonia). A traveler appears and Meri, now revealed to be sitting in a desert of his own imagining, learns about the origin of the world, in particular the part of it that would become Estonia, from a disguised Manfred Mim. The opera goes back and forth in time and place – including scenes in 1964 at the Werner Café in Tartu (which is still in business), ancient Athens in 300BC (with a cameo from Aristotle), Turkmenistan in 1962, and many scenes that revisit 7000 years of the island of Saaremaa and its famous Kaali crater (made from the explosion of a meteorite, which provided the “shock” of the opera’s title, galvanizing the original appearance of human beings, transformed from other creatures). Mim’s idea of tracing the sonic echo of this pre-historic explosion in the lines of the local limestone – a sort of mineral Raudive experiment – is doubled by Meri’s idea of following its traces in folklore. Both projects explore, as it were, the ur-sound of Estonia as it threads through the satire of Mim’s time travel experiments, culminating in his instigating the building of the Song Festival pavilion in Tallinn (completed in 1960) as a resonating chamber to condense the weight of Estonian depression, which will allow for the bending of time. With over 30,000 people singing together of their national misery, a great experiment is accomplished, allowing a satirical return to the first, mythical Estonian community, rather than evoking the historical “foundation” of the 1918 republic. Besides orchestra, electronics, and an on-stage Café band of muted trumpet, drums, and double bass, there was also an unearthly chorus singing from the back of the auditorium, who made a range of evocative sounds, not only vocally but also with the rustling of leaves and by wiggling fingers in amplified glasses of water. Bringing together the experience and resources of a major institution with the invention and wit of a maverick artistic collective, this “Shock” proved one of the most dynamic collaborations in the festival. By contrast to these three productions (which took on the fact that the past is not what it used to be, while yet evading the question of what it still could be – historically, at least, rather than imaginatively), the majority of the other shows seemed caught in the dilemmas of the centenary commission. Despite all the differences between them, the productions also demonstrated the hold of certain tropes that seemed to speak already for a “100 year story.” Each production evinced, in its own way, a dynamic of reflecting on the past as a story of people’s desired “freedom” or “independence,” and also a desire to be free of, or independent from, this past (without, however, effecting a new drama that was not still defined by it). An analogy might be made here to The Laocoön Group, a nineteenth-century copy of which was commissioned for Tartu University’s Art Museum where it is still displayed as an “example” of the changing meaning of such models of and for artistic expression. Like the snakes that hold onto the priest and his sons, an image repertoire of the past, often citing the folkloric, seemed to be culturally prescribed for evoking questions of “national” identity, regardless of the research undertaken in particular productions. Distinguishing, then, between the myth of the national and the repetition of national myths was not always obvious. As in Aareleid’s novel, the question of which “era” we are in was a recurrent concern. In the novel, this question even refers to a model provided by theatre: “Mrs Wunderlich stares at Tiina. Her eyes glisten and her hand trembles slightly. ‘That was before,’ she concludes, ‘in the Estonian era.’ Tiina ponders. ‘But what era is it now?’ she asks. ‘Now’s a different era, the Soviet era.’ Visits to Mrs Wunderlich’s room are always like a journey back in time. There’s nothing there from the ‘new’ era… It was a little like being at the theatre. Once the lights come up, you realize that you’ve been here but also somewhere far away.” Perhaps the most direct examples of this analogical “theatre” were offered by two new plays commissioned from one of Estonia’s most popular writers, Andras Kivirähk: Mistress of the Raven’s Stone and The Swallows of Fatherland. Indeed, in terms of audience reception, these were unquestionably the most successful shows, with full houses in contrast to the sometimes half-empty auditoria for the more formally demanding projects. The first of these plays, Mistress of the Raven’s Stone, was a collaboration between two regional theatres, the Endla Theatre and the Kuressaare City theatre. I must confess that it is a while since I have come into a theatre to see a “dressed” stage, showing an interior complete with chaise longue, cushions, table and chairs, fake doors and windows. With such a set, the expectation promised by the house lights dimming is particular – offering an invitation to enter into the world of illusion. A projection announces that it is 1951 and, as a woman enters, gradually settling into being back “at home”, the room is revealed again by the stage lighting which spreads with her movements. Finally she stops by a smashed up bookcase – evidence of the NKVD having visited – which she has left as it was found in a previous return home, after her parents had been arrested and deported. The next person to enter is a young man, and the story of the pair’s relationship then unfolds: as she, Ilse, endlessly re-reads pre-war magazines that had been left behind by her parents, with their adverts for middle class commodities, and he, Heino, reads the new Soviet newspapers, extolling the efforts of workers exceeding the five year plan. She is conserving the possibilities of renewal with the resources of the past, and he is wanting to clear the past away to make room for the creation of the new. While he is inspired by the transformative power of the hydroelectric dams he reads about in Pravda, she is a medium for the transformative power of folk magic – using the raven’s stone of the play’s title, which is handed down through generations of a family. Here the relation between past and present, history and allegory, plays out not only in the fiction of the stage, but also in the reality of the theatre (with an audience who are evidently warmed by the story being told). The characters – not least, in the gendered ascription of their virtues – appear somewhat as ciphers: Ilse for honesty, loyalty, trust, and Heino, it turns out later, for selfishness and betrayal. The other characters move between these poles, divided within themselves (especially the Kolkhoz chairman and the NKVD officer, who has fallen in love with Ilse). Their personal stories, woven through with the difference between old Estonian “witchcraft” and the new Soviet “realities” (that are mostly “failures” in practice), are set against the historical background of the guerrilla war waged by the Forest Brothers, who continued fighting against the Soviet occupation into the early 1950s. This play of inside and outside is animated by the classical dramaturgy of entrances and exits – in which the door itself plays a role in each scene, which always starts off as a dialogue before the entrance of a third character. The play also offered an ambiguous ending, as the “fighters for independence” murder the bearer of Ilse’s hopes for the future, the half-human woodland creature whom she has cared for and who magically made her a gift of the wedding dress that she had long wished for from pictures in the pre-war magazines. The art of balancing the comic and the tragic – for which Kivirähk is renowned – produces its own conventions, framing theatrical possibilities in terms of a sensibility that is clearly shared by his audience. Swallows are the “national” bird of Estonia rather than ravens or eagles (the latter an emblem of the Romanovs, after all), but here it is suggested that perhaps sparrows would be better. Swallows, which come and go, are associated (by one of the characters in the piece) with emigration – whether of a daughter to Australia or of an estranged boyfriend who works in Finland. Indeed, in its own way, the play was subversive of the very project of the “tale of the century,” being witheringly critical of contemporary corruption and cynicism while never ceasing to be sympathetic. Neither sarcastic nor simply nostalgic, the play invited us to laugh with the characters rather than at them; but, if one was to abstract what the women had to say into an essay, it would be caustic in its criticism of the mythologization of the 1918 founding of the republic, especially as compared to the politics of the present. Also evoked was the generational difference between an older concern with the politics of national identity and the “identity politics” that the EU generation is familiar with. This was symptomatized in the figure of the “other,” which is still overwhelmingly identified with Russians, but which also appeared in the dialogue here in the modern form of prejudice against “blacks and gays.” Rather too easily recited in the play, this perennial trope was most explicitly (and perhaps also symptomatically) rejected by the oldest of the women, reversing expectations of the different generations. Her death later in the play also provided a deeper echo of that shared humanity, which comedy so often fails to address by making “difference” only a caricature. The other “proper play” in the festival, also performed outside of Tartu’s historical Vanemuine theatres, was Million Dollar View by Paavo Piik (in a collaboration between the Tallinn City Theatre and the regional, independent company, Old Baskin Theatre). Million Dollar View equally took a critical view on the claims to virtue of the newly independent republic. Loosely based on the real example of an Estonian woman in the new millenium who befriended elderly men to con them out of the title to their homes, the play offered a curious inversion of the restitution of property that remains unfinished business in Estonia (as in other post-Soviet countries). Indeed, the story of restitution was mirrored by that of dispossession, not by the state this time but by commercial fraudsters, manipulating Estonia’s e-government administration through digital identity theft. On the one hand, there was celebration of the return of pre-war brands of sweets; and, on the other hand, there was the question of social values with the example of continued preying on the vulnerable by the unscrupulous. Initially set up to look like a familiar story of family deceptions, the play became a social allegory in which the family, finally, provided a refuge. Here, once again, comedy provided a world defined by its own conventions, not only theatrically but ideologically. With echoes also of The Cherry Orchard, the play was originally conceived for performance in a particular building in Tallinn’s old town, the ownership of which has been in legal limbo for years. 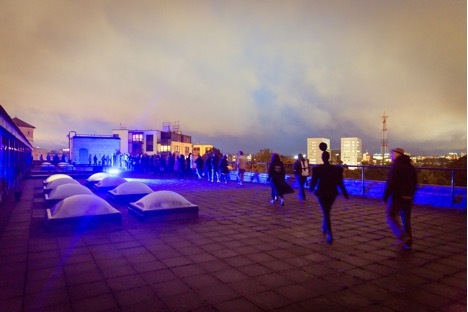 Adapted for this one-off outing, it was shown here in a temporary theatre built on the top deck of the boat that hosted the Festival Club on Tartu’s Emajõgi river – a venue without foundations. During the interval, as I watched the set-change from the river bank (with the furniture props being carried up and down the outside stairway), I was approached by an old man, unkempt and nicotine-stained. He said tere (hello) and then asked me something, holding out two fingers with his left hand. I fished in my pocket and found a two-euro coin, which he seemed satisfied with, saying aitäh (thank you) as he wandered on. This scene echoed one from Kivirähk’s Swallows, in which the unemployed son of one of the women is constantly coming into the drama group meetings to cadge another two euros from her for a beer. Even though I did not understand what the old man had asked me, I knew what he meant; not just from the everyday familiarity of such encounters, but because I felt the scene had been foretold earlier – in the theatre. Sirk’s Estonia (It could have gone differently). Photo: VAT Teatre. As a mute prologue, however, while we were waiting to be let into the theatre space, members of the audience began separating themselves from the rest, to the doleful beat of a drum. Dropping their bags and items of clothing, they left us in the foyer, separating themselves off in the zone between the inner and outer doors of the museum. Before the opalescent glass, then, was a field of abandoned shoes and other items; and beyond it only human silhouettes. Gradually, that in-between space transformed into a cleansing sauna, the figures beating each other with branches as the drumming changed rhythm. Finally, there was silence and the naked figures left to the outside. The smoke that had filled the transition space swirled out into the foyer, lapping up to the audience, while the departing figures headed toward the horizon of the old Soviet runway. This was an effective use of the site, adapting a performance which had been originally made for the National Library in Tallinn, evoking not just the dead but the specific memory of the mass deportations to Siberia in June 1941 and March 1949. We then descended to the museum’s basement theatre space (via the queue for earphones for the translation) to watch the play. Presiding over the stage was a portrait of the fictional Ernst Meel – the founder of the “national show” (a reference to the centenary project itself, perhaps). The paradox here was that the Sirk narrative, offered by the rehearsal of an “alternative” show which constituted the main part of the performance, turned out to be another reality-denying fiction. Interestingly, Sirk’s Estonia, by Aare Toikka and Mihkel Seeder, was composed with reference to two plays which interrupted each other: an established “national spectacle” and an insurgent challenge to it. The latter offered a counter-factual “history,” exploring a narrative of the inter-war republic in which Sirk (the leader of a right-wing nationalist movement, the VAPS, founded as an organization of veterans of the 1918-20 war of independence) was successful in a planned coup in 1934. The parallels between Sirk and his contemporaries, Mussolini and Hitler, were made in the play (although one might also mention Smetona, Horthy, Antonescu, and others), which made for a complex context for the ostensible “desire for historical truth” expressed by its fictional author on stage (and perhaps also by the real ones off stage), set against the framing device of Meel’s fictions. The play’s project appeared to be to restore Sirk to contemporary attention, as a figure who has been excluded from the mainstream “independence” narratives of the Estonian republic, which have been written in the image of Konstantin Päts (who became head of state in a “pre-emptive” coup of his own against the VAPS movement in 1934). With the subsequent suppression of parliament came what Estonians call the “era of silence,” as independent politics was curtailed under his government. To the authors of the play (at least, in the guise of their fictional surrogate on stage) Päts and the head of the military Johan Laidoner (himself previously linked to the VAPS) conspired to destroy this source of populist politics and to have Sirk killed whilst in exile in 1937 (historians generally agree that Sirk committed suicide). In the play’s “miracle” alternative history, the VAPS coup succeeded, and Sirk headed a government of national unity under which “the people” would have resisted the Soviet threat (as did Finland) in 1940. Indeed, the play ends with footage of the famous “armored train” divisions of the anti-Russian resistance in 1918, as if the Molotov-Ribbentrop pact didn’t signal a quite different historical reality to the collapse of the Romanov Empire. The geopolitical situation at the start of the Second World War was, after all, scarcely comparable to that at the end of the First World War; and so, perhaps, the most telling aspect of Sirk’s Estonia is the supposition that they were similar. The revisionist account against Päts “handing over” sovereignty to the Soviets without a fight takes many forms across the political spectrum: he is widely held to have “capitulated” rather than averted a greater destruction – as, indeed, occurred when (in contrast to the pseudo-“democratic” coup of 1940, which installed a pro-Soviet puppet government) the Soviet Union invaded in 1944, “liberating” or “reconquering” Estonia from the Nazi occupation, following the unilateral abrogation by Hitler of the pact with Stalin in 1941. Nonetheless, the play foregrounded precisely its own fictional construction – made explicit, for example, by having both Sirks and Laidoner played by women, even as the Päts narrative was being challenged. The irony of this remained in its refusal to recognize its own historical (distinct from theatrical) conditions of possibility – where, for example, the role of Germany in Estonian history, and not just during the totalitarian decade, was simply absent (in this play, as in all the others at the festival). It appears as if the post-1918 republic had, indeed, successfully wiped away centuries of relations with the Baltic Germans (a theme of Anton Tammsaare’s 1935 novel I loved a German) in its own account of “independence” and “sovereignty.” One might then wonder about other voices that are also “silenced” in the return to the Päts era – as if to the only historical alternative in overcoming the post-war Soviet era. Arguably, the “flower children” did, nonetheless, have a lasting impact, not as a local nationalist “revival” but precisely as part of an international “pop” culture whose references, especially in music, are still resonant today. The play ended with the theme of a flute without holes, taken from the first half, “as impossible to play as it is to jump over one’s own shadow.” The closing sound track, indeed, offered flute music as newspapers rained down, with headlines from the end of the following decade and, precisely, the collapse of “the system.” (The all-singing curtain call was also given to “the tune of the revolution.”) Some of the audience had left at the interval, and thus missed the characters’ stories in the second-half that related to their encounters with State Apparatuses. There was, perhaps, a potential play of mirrors here – between the in-culture of the Hippies and that of the KGB employees, each with their identifying slogans and obligatory reading, and both with a self-defining removal from society at large. Instead, we learnt the tragic stories of most of the friends, whose desired freedoms had been curtailed. Included in these friends was a homosexual character whose closet was furnished by the privileges accrued in becoming a Party apparatchik, and another whose dodging of military service through faking illness ended with his being incarcerated in the psychiatric system. Here, any potential allegory was grounded in everyday “realities,” which somewhat rescued the performance from its many clichés. 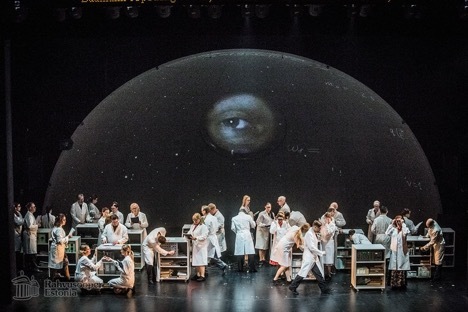 The performance that trailed the most critical success was the award-winning BB at Night, a collaboration between two independent companies, the Tartu New Theatre and Tallinn’s much longer-established Von Krahl Theatre. The production was in three parts. It was based on Mati Unt’s last novel, Brecht at Night (1997), which I was glad to have read beforehand, since even the Estonian audience found it hard to follow the performance, especially the fragmentary scenes in the third part. 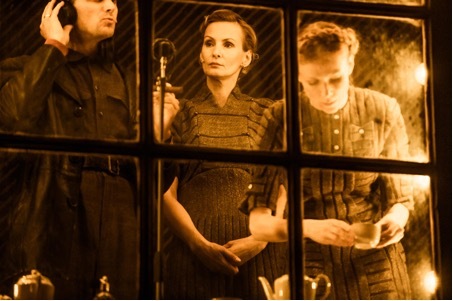 What most distinguished this production was its use of a “railway journey”: two audiences, one travelling from Tallinn, the other from Tartu, meet at Tapa, whose station had been a collecting point during the Soviet deportations. The upgrading of the Estonian railways in the past decade has left the central platform at Tapa unused and its station building closed; in marked contrast, for instance, to the gleaming restoration of the old building at Tartu station. The quarter of an hour difference in arrival times between the two audiences was itself factored into the first scene at the station, in which both audiences were inscribed in a role play, as extras in a film production set in the 1940s. BB at Night. Photo: Von Khral. Arriving at Tapa, then, the audience participates in the fictional filming of different scenes, with the old station building as a background. The harassed director wants us first to be waving farewell to departing deportees; and then to be waving a welcome to a delegation arriving by train from Moscow. In a third moment, we are asked to “react” angrily to a speech given by Päts from a window, as if recreating the historical scene in which he was jeered during the sham elections that deposed him and installed the pro-Soviet government in 1940. (Päts, like Laidoner and most of the 1930s’ political elite, died in Soviet imprisonment.) All of this audience “participation,” however, seemed uncritical in that it repeated the very theme of state-management of “the public” (albeit now as willing volunteers, rather than terrorized or humiliated ones). The audience’s smiles from the earlier facilitation would return at the very end of the show via the filmed scene, as the image of waving was projected on the walls inside the building where we were seated. The final scene of the play we had just watched, with its walls of birch trees on the stage, was itself perhaps an echo of the Zurich premiere of Brecht’s Puntila in 1948. Rather than as a caution about the public spectacle of the totalitarian years, the film images were received – perhaps inevitably – with a welcome recognition by the audience of themselves, with no apparent sense of questioning the underlying repetitions. The media through which an audience’s presence is re-inscribed are so familiar, it seems, as to be politically invisible – even as we were being told that the world’s most popular song in 1942 was Irving Berlin’s White Christmas. What might have been a dialectical point about tragedy and entertainment in a Marcel Ophüls production, for instance, seemed to be taken as simply providing an up-beat ending. Here is, surely, where the art of the production could (should) have come into play, interrupting in some way the imagined suturing of fictional past and “immersive” present, especially where the play had Bertolt Brecht as a leading figure. (This was missed in the play’s own fiction of “filming”, as if “selfie” culture does not require something different in “representing” an audience.) Was this naivety or cynicism on the part of the performance makers? Was this an irony associated with the “post-modern,” in which the clichés of the reception of Unt’s work still seem to be stuck? Or was there, indeed, an echo of the dialectical (evoked in the name of Brecht) – not being an explanatory way out of an artistic conundrum, but being emblematic of the conundrum itself? Given that the most jarring aspect of the performance was its use of snippets of recorded orchestral music (from Prokofiev, Sibelius, and, most bizarrely, Elgar’s Land of Hope and Glory), which offered no connection with the acoustic of the place that we had been brought to specifically, the last option seems unlikely. Indeed, the production seemed to be built on its vision for the piece, rather than the details of its performance. The second production shown at the National Museum, Before Us, the Deluge: An Epic Communal Drama, was a collaboration between the Tallinn-based youth theatre NUKU and an independent programming space, Vaba Lava, which had commissioned two film makers, Jaak Kilmi and Kiur Aarma. The piece was performed in a huge space, literally curtained off from the museum, and with it the permanent exhibition’s installation of “encounters” – a set of video interviews with people who lived through the decades of the 100 year story. The large set presented oversize pipes and balcony window frames, which offered screens for film projections, and a lift at the center of it all. All this represented a block in a 1980s’ Soviet housing development called Õismäe on the outskirts of Tallinn, one with familiar problems, where the advertised amenities such as central heating worked only by means of local fixes (central planning sustained by local creativity) and fraud (the second economy of actual work, rather than that of the planners’ statistics). The plumber, for example, bills the flats’ residents for parts that were not used on the job, so that he can then use them for private work elsewhere. The play offered the story of Õismäe, refracting the political changes of the last decade of the Soviet era through the lives of three children growing up on the estate. The story is told to us in direct address by three adult actors, with accompanying video projections and the occasional appearance of a chorus of school children and a few “soloists” illustrating specific aspects of the narrators’ lives. The themes of these stories were clearly generalized, allowing the audience to recognize themselves in aspects of them, so that the tales became allegories of the times, reflecting obliquely on political changes through their impact on the social life of the three youths. We saw the counter-culture of punk (opposed to the officially sponsored music scene), the new entrepreneurialism (opposed to the Soviet parallel economy), and disco (opposed to folkloric dancing or ballet). With little theatrical imagination, however, it was all tell-and-show in a fairly literal fashion; although the stories were engaging in themselves, they hardly engaged with theatrical metaphor specifically. While the deluge of the play’s title concerned the literal flooding of the block of flats, owing to the shoddy installation of the central heating piping, the play also evoked the Biblical cleansing of the world’s corruption; while, as a political metaphor, deluge is also associated with the reactionary views of monarchical absolutism in pre-revolutionary France. The inverse of this, concerning what came before Estonia regained independence, was perhaps meant to be optimistic; but it becomes rather less so when read through Marx’s adoption of the image in describing the new capitalist age. Addressing the history of struggle for a “normal working day” in Capital: “Après moi, le déluge! is the watchword of every capitalist and of every capitalist nation. Hence Capital is reckless of the health or length of life of the labourer, unless under compulsion from society.” Bizarrely, in this context, the mass culture of the 1980s glimpsed in the show included a hugely popular Soviet TV hypnotist and “psychic healer” Anatoly Kashpirovski (the Rasputin of the dying days of the Central Committee) offering an intriguing historical counterpoint to the magic of Stalin’s portrait for an earlier generation. The fundamental question here of the defense of society is no less pressing or urgent today than at any other time. If the flood in question was caused by the shoddy Soviet building construction, elevated to the giddy heights of biblical echo (where, after this devastating example, Jehovah decided not to punish humanity again, despite their sins), there was still a problematic “moral” for me in the discrepancy between form and content concerning the appearance of the children in the production. Intended as a contemporary cautionary tale about conformism, the production itself had manifestly offered no collaboration, no devising together, with the children involved, who seemed to have been simply told what to do and how. The show’s content was supposed to be a celebration of creative freedom, and yet the form of the piece made the actual children (distinct from the fictionalized ones presented by the adults’ narratives) passive rather than active participants – a demonstration of the very opposite of its ostensible ethos through the repetition of what was being condemned. To Touch the Moon was a collaboration between Rakvere theatre and the contemporary dance company Fine 5. It was in every sense “black and white.” The set and costumes – except for a couple of garish disco numbers – gave a limiting context, in which contrast was not used for Expressionist intensity, but as a literal reflection of the story’s core oppositions: folk dance (dance “with roots”) as opposed to expressive dance (“free from roots”); independence through personal integrity as opposed to drug-fuelled violence, associated with cowboy capitalism. These juxtapositions were also manifest in the (failed) collaboration between the literary and movement-based work, which seemed not so much explored together as divided between the two companies involved. The dramatic narrative set up an explanation of and for the dance, which then appeared to be a literal illustration of it, distorting any possible reception of the dancers’ work. The metaphor of “free” dance, then, seemed rather misconceived, however well it may have been performed. In contrast to the Hippie era, the 1990s was the cocaine decade: the question of alternative realities arose with “white freedom” rather than with cannabis or the fumes of Soviet-era stain remover. The conflicted meeting point of these was shown in the ambition of a young woman in a provincial dance club: “to touch the moon” would be to belong to an Estonian community (folk dance), and yet to enjoy the personal freedom of her own dreams (contemporary dance), without the destructive effects of drugs and corruption represented by the character of her brother. Like most of the festival productions, the play concerned not only freedom to express oneself, but also freedom from the burdens of the past – emblematized here by the character of “the grandson of a deporter,” a “free” dancer whose relationship with the heroine is destroyed by the insistent recollection of that past in the present. The complications entailed were dramatized in the fact that not only does the woman’s brother threaten violence to stop the relationship, but he is himself responsible for the other man’s self-destructive cocaine addiction. As if to demonstrate to sceptics that the determinants of the cultural unconscious are best revealed by chance (in which the alibis of repression appear to be circumvented), Tallinn’s resident Russian Theatre was assigned – by the ruses of the lottery – to develop the show that addressed the next (rather than the last) 100 years of the Estonian Republic. Founded in 1948, the company plays in Russian with Estonian surtitles. Indeed, the theatre has an active program of engagement trying to build bridges between the two communities, although it is its very distinction within the Estonian theatre landscape that makes it of particular interest, not just to the Russian-speaking minority. For the production To Come/ Not to Come. Estonia in 100 Years, the initial research asked children about their visions of the future. These were communicated through a future TV “news” program (whose presenter never ages). The children’s drawings were used for digital animations, the projection of which was a recurring element of the show. Another recurring element was the invitation to the audience to participate through a dedicated website using their mobile phones, allowing them to vote on various options offered at turning points, starting with the collective decision as to whether we wanted to see the “simple” or the “complex” version of the production. The range of subsequent choices in the former would be much more limited than in the latter and, depending on the audience’s choices, the performance might then run from 40 minutes to three hours. Apparently, there are 38 different versions for which the company are prepared, with no one show being the same as another. The performance I saw, therefore, was as much a reflection of the audience that I saw it with as it was a reflection of the work’s dramaturgy. This interaction was not only the means but equally the ends of the work’s “moral:” that what the future holds will be the consequence of actions in the present. As it turned out, our audience was optimistic in its choices and worked its way through to the “happy ending” (although this was more than a little ambivalent). With a live band, the recurring audience choices evolved into a pastiche TV game show in which the Russian family – whose story we had been following – was involved in a contest with a series of familiar “citizenship tests.” The aim of the contest was to win the right to remain in Estonia. The family’s success was celebrated in the end by an enthusiastic song, which had unfortunate echoes (for me) of the Ernst Meel show (in the Sirk play), the fiction of which is anyway not so far removed from much of contemporary culture, albeit identified with global corporations rather than national states. The echo of Schlingensief’s Please Love Austria event for the Wiener Festwochen in 2000 (better known, perhaps, as Foreigners out! Schlingensief’s Container) was distinctly uncomfortable, especially in the relentlessly positive song, which, ironically, also offered an echo of the motto “all’s well that begins well and has no end!” from another, very different work. This work, the 1913 “futurist opera” Victory Over the Sun, is part of the heritage of Russian avant-garde performance. 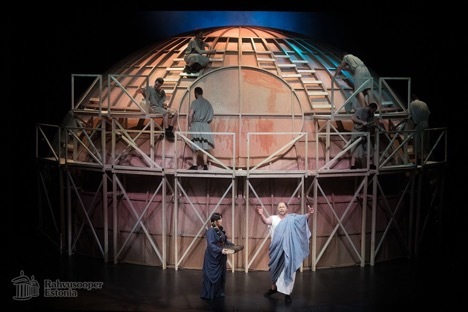 Indeed, the “100 year story” production made a central metaphor out of the future creation of an artificial sun – one without the aging and cancer-inducing effects of the current one and one which would overcome its habit of disappearing for the winter months. While, in the future, people’s capacities are also artificially augmented by micro-chip implants, they still visit retro shops to acquire – for example – a bottle of champagne for a celebration. One of the “apps” downloadable to these micro-chips was a universal translation device that was utilized in a scene in which a new family member was welcomed from abroad with a European minestrone speech, made up of words from many different languages. The phrase “multi-culti” – or, rather, “multi-kulti” – stands out to Anglophone ears (amongst others) in most Central and East European languages, not just Estonian. The cultural distinction between the familiar and the foreign (hinting at that between friend and foe in politics) was also played out in the costumes – in which the new family member was identified in terms of a current “other” (a successful entrepreneur in this case, rather than any asylum seeker), as Arabic or Middle Eastern; while the “true Estonians” in the final game show were presented in folkloric dress. It was hard to tell how much of all this was ironic and how much was “genuine,” since the international visitors in the audience were not really the addressees of the performance and translation was virtually impossible. This perhaps touches on a broader question about the different “voices” in the festival productions – where, besides the already mentioned Germans, the stories of émigrés or exiles from an earlier generation, or from today’s emigrants, for example, were entirely absent. That the future was represented by “news” in Russian seemed all the more apposite therefore. It was interesting that none of the festival’s productions really addressed the stories of Estonians who participated in the occupation regime – as if it was something that had happened to Estonians without involvement by Estonians. Can these people be simply reduced to the category of “collaborators” – not just in the Stalinist era but in the following 40 years (that is, a whole generation)? The Soviet “normality” was only satirized or repudiated here, with Estonian creativity seen essentially in terms of counter-cultural activities – whether as esoteric with the raven’s stone or internationalist with the Hippies and Punks. The question of being free from the past concerns not only which past is the subject of a story, but also whose voices are heard to articulate and contradict it. This is no doubt the case in any “national” festival (not least when considered in the light of post-colonial critiques), but given that there was no ostensible national agenda for the commissions (devolved to the individual companies by lottery, after all) it was perhaps curious that many of the productions tended to reproduce a similar set of tropes rather than strike out on more surprising paths of their own. As a final reflection, I must admit that I am also sensitive to the question of “small nation” politics, coming from the UK, which is an island off the coast of continental Europe, where politics – still immersed in the phantasies of empire – totally fail to engage with this minor status. Indeed, that it is the exploitation of resources from empire – not only mineral but also human – that made Britain “great” seems scarcely part of mainstream political, or even educational, discussion. As a consequence of its imperial history, Britain is one of the world’s richest countries, whilst endemic poverty persists and inequality is so institutionalized that it is seen as part of the national heritage – in which people even perversely take pride. Returning to the juxtaposition between cosmic stories and historical details offered in the festival’s opening night’s productions, I have cause to reflect on where I came from to be at the performances. The lesson that small nations need alliances – cultural and not just commercial – is brutally denied by a significant part of British politics, which (not least with the Brexit referendum) has captured government. This has been shamefully demonstrated (yet again) by the British Foreign Minister, Jeremy Hunt, comparing the EU to the Soviet Union during a speech to his party conference in October 2018. The reply from former Estonian President Toomas Ilves suggesting that Hunt should read some history was typical of many from across Central and Eastern Europe. The post-Soviet peace in Europe that we have been so privileged to enjoy is in new jeopardy with the refusal to develop an understanding of “sovereignty” through internationalist commitments. It is worth remembering that 2018 is also the fiftieth anniversary of the invasion of Czechoslovakia and that the Crimea is now an annexed territory. Amongst the “lessons of history” – not least, through metaphors offered by the arts (“building bridges to the past” or even “slipping from its coils”) – is that the very relation between learning about and from history is not a given, but concerns a capability for which theatre and literature still offer examples. Mischa Twitchin is a lecturer in the Theatre and Performance Dept., Goldsmiths, University of London: http://www.gold.ac.uk/theatre-performance/staff/twitchin-dr-. Besides his academic work, he also makes essay- and performance-films, examples of which can be seen on Vimeo: http://vimeo.com/user13124826/videos.